Scientists in California say new technology will soon allow massive 3D printers to build entire multi-level houses in under a day. University of Southern California Professor Behrokh Khoshnevis has for years been working on a building printing technology called “contour crafting,” and has earned accolades from the likes of the National Inventors Hall of Fame and even NASA for his efforts. Soon, he says, he’ll be able to use that system to create entire structures out of concrete using what is essentially a gigantic 3D printer. Just as basic hobbyist models let designers create three-dimensional objects from bottom to top, Khoshnevis says contour crafting is working on bringing that technology to the realm of urban construction. It is "basically scaling up 3D printing to the scale of building," Khoshnevis told MSN recently. Everything is being made automatically nowadays, the professor told reporters, from shoes and clothes to home appliances and automobiles. “The only thing that is still built by hands are these buildings,” he said. Should the scientist stay on track, soon people will be able to have custom-built, 3D-printed homes in less than 24 hours. Hobbyist models of 3D-printing machines are currently available for only a few hundred dollars and lets developers feed spindles of plastics and polymers into a machine that transfers digital blueprints into tangible products of all sorts. By taking this technology to a bigger level and using concrete, not plastic, Khoshnevis thinks he may be able to revolutionize the way homes and other structures are built. The process begins with leveling the area where a 3D-printed house will soon be built, and then trenches are dug around the perimeter and filled with concrete. 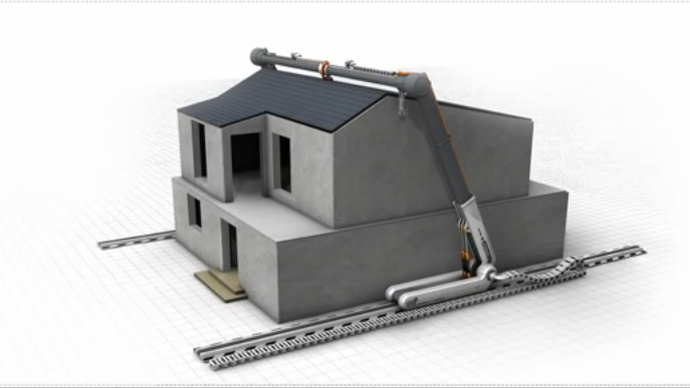 A system of rails is then erected on the sides of the foundation, and the printing contraption itself is then lowered down using a crane and fed the building materials. Like traditional 3D printers, the system carefully spills out those materials layer by layer as the machine expands to a height of roughly two stories, consistently building upward as more concrete is unloaded. Instead of being left with a plastic toy or, as some have made possible recently, a gun, this process would ideally soon enough end with an entire structure created from close to nothing. “Using this process, a single house or a colony of houses, each with possibly a different design, may be automatically constructed in a single run,” the Contour Crafting website reads. The designs take into account additions that would need to be added after the fact, like plumbing, electrical lining and windows, which can then be easily outfitted once the rest of the structure is solid and standing. Contour Crafting could be a critical tool with regards to quickly building structures in booming urban areas, the website continues, or, should the opportunity arise, locales that are a bit more out of this world. The scientists involved say that they’ve conducted research that could be used to put 3D-printed homes eventually on other planets, and claim that “Contour Crafting will most probably be one of the very few feasible approaches for building structures on the Moon and Mars, which are being targeted for human colonization before the end of the new century.” Khoshnevis even says materials mined from the lunar surface could be used to create these homes. In the meantime, Contour Crafting’s website suggests they’re exploring options on Earth. Khoshnevis says that his invention could help relocate people who have been uprooted from their hometowns due to war, economic turmoil and natural disasters, and could offer “affordable and dignified housing” for the impoverished.